A versatile storage basket for almost any space in your home, the Ara Reversible Storage Basket is stylish, modern and easy to coordinate into many different styles of space. 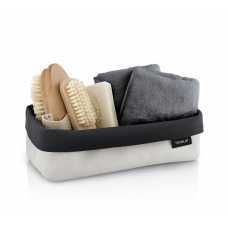 It is a soft textile storage basket, which, as the name suggests is reversible and can be used in any room. It is a reversible and washable canvas basket and it is available in a choice of colours and sizes. The basket is a good choice for storing toiletries in, or popping on a cabinet or closet shelf for storing clothes and accessories.